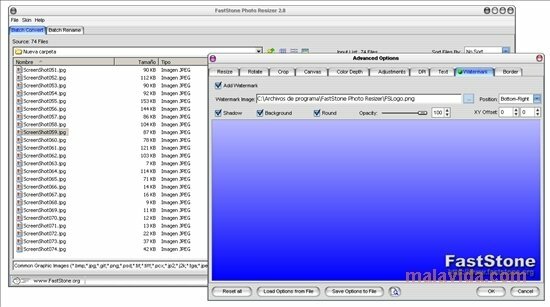 We all store images on our hard drive, but, if we receive them from different sources, it's probable that each one of them has a different size, format and name. This can make organizing these images chaotic. And the same would apply if we want to use them in a website. 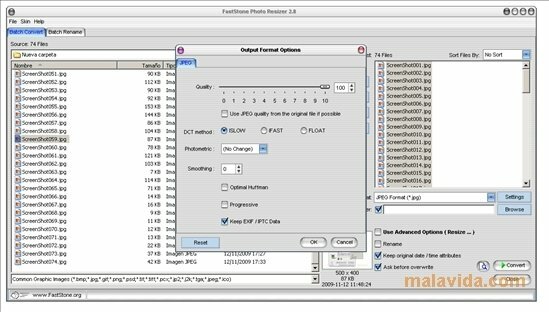 FastStone Photo Resizer is a tool that will allow us to apply all sorts of changes to many of our image files at the same time, like renaming, resizing (keeping the original look or note), rotating, reversing, inserting watermarks (using text or PNG files), adding frames, changing the output format and quality or applying color effects. All this is done from a simple and intuitive interface (that is completely customizable by means of skins, that are included), we only have to select the directory that contains the images to be modified, select what changes we want to apply, press the convert button and done. 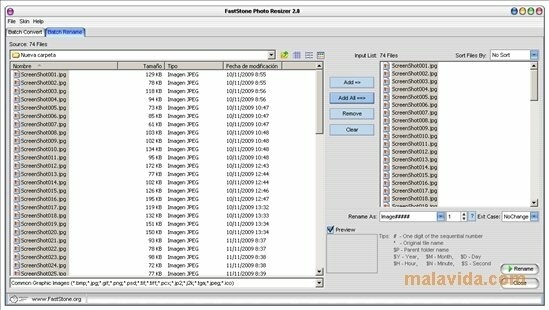 Download FastStone Photo Resizer and easily order all the images stored on the hard drive of your computer.